What could be more fun that pulling in to a parking spot at Whole Foods after a very long day, only to have another anxious and sneaky driver steal that spot from you? Apparently it was getting very real in the store&apos;s parking lot, when a Prius was lurking around like a hungry shark trying to slowly creep into that one vacant spot. Unfortunately for the Prius driver, his space was already taken by a much smaller Volvo, that got towed. With the EV switch in full effect, this guy went into full stealth mode. The same cannot be said about the micro shopping carts and his attempts to pull up to the cashier. Enjoy this funny NSFW (just some language) video about the Prius Getting Real in the Whole Foods Parking lot courtesy of Fog and Smog Films. As expected from the definitive mass-market hybrid, the Toyota Prius is a very well-rounded family car. It's the car every enthusiast loves to hate, so is it bad to admit we like it? 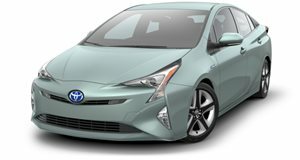 50 miles per gallon and AWD grip makes the Prius one of a kind.